Along side with them, there will be improvements and bug fixes as well as other new features. This version is targeted for April release, but the plan could be changed if it need more time to be fine-tuned. Please stay tuned for more news. Since our announcement in Sep 2014, we have worked very hard to develop Solidres for WordPress and now it is time for the first public release. You can download it in our Downloads section or see the demo. The features set of Solidres for WordPress v0.1.0 BETA 1 is almost the same with Solidres for Joomla v0.7.2. We are still working to keep it up to date with Solidres for Joomla v0.8.1. This release is considered as BETA, therefore it should be used for testing purpose only. 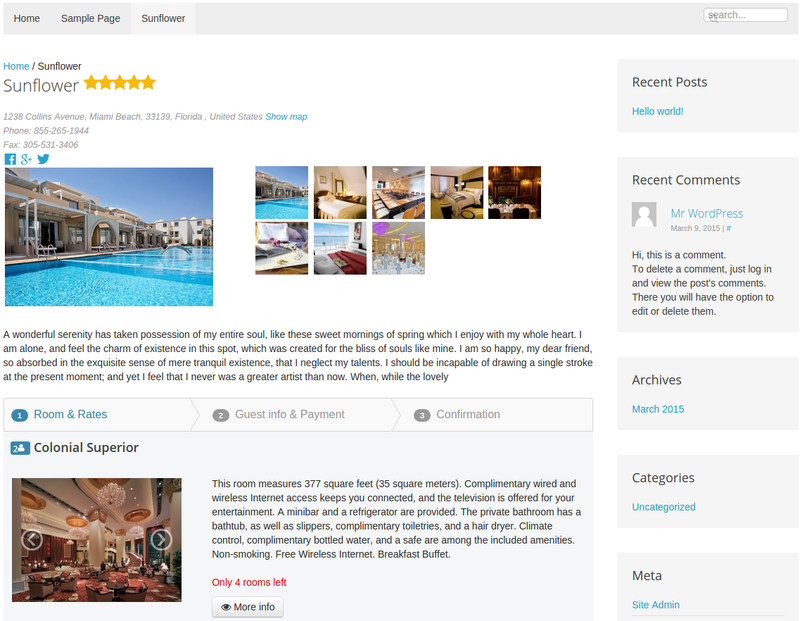 We are also working to bring commercial features to WordPress as well, please stay tuned. The first page should have the same slug with your asset’s alias. The second page will be served as a “Reservation completed” page. Go to menu Systems – Settings – Pages and select the first page for field “Single asset”, then select the second page for field “Reservation completed”. Go to menu Settings – Permalinks and choose a setting which is different than the default one. Go to Appearance – Menus and insert the first page into your WordPress menu. Until the stable release, we still have a lot of works to do. If you found any issues, let us know by posting in our forum. Remove min/max nights limit in tariffs crossing. Fix theme can not be saved in Asset. Update Greek translation and add German/Greek/Cyprus states into sample data. Add French and German translation. Show map in modal window instead of new page. Remove incorrect dashboard navigation bar when edit reservation in front end. Fix issue when guest should see the reservation they made while registered account. Update template to support Solidres v0.8.1 and new commercial plugins. Download 0.8.1 and install using Joomla Extension Installer, it will automatically update your current version. Or you can update using the built-in Joomla Updater.